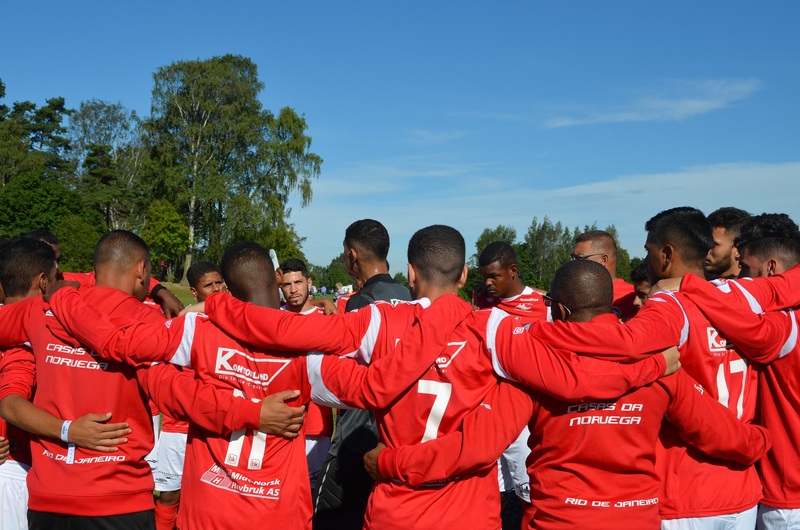 The positive feedback regarding the player’s behavior, the fairplay, humbleness and teamwork were the big achievement after the Norway Cup closure according to the NGO founder and leader of Casas da Noruega team, Snorre Holand. “We didn’t get the gold nevertheless the compliments regarding the great impression that the boys made in everyone are the most important win. This was our confirmation that the education in school is giving results. Is not reaching the highest position in the competition is the motivation of building a life. That’s our main goal so I think we won”, says Holand. The NGO (non-governmental organization) has been working with social and educational projects in the local community of Bancários (Rio de Janeiro) since 2009 and one of the activities is the soccer training for boys and girls as pedagogical support of the school. The group of teenagers between the ages of 18 and 19 years old from Brazil started training since December last year to represent the social project Casas da Noruega in the biggest youth soccer tournament in the world. The team Casas da Noruega has won all three of the Norway Cup qualifying rounds, and was the leader of its group with 9 points. During playoffs, the team won Søgne for 3 x 0 and Holmen also for 3 x 0. The team ended up scoring 18 goals in five matches and not did not concede any goal during the regular time. Brazilians lost the match against Skeid on penalties shoots after two rounds of extra time. “Keeping in mind that this is part of the education process: not winning. In the daily life we just don’t win everything”, reminds Holland. The NGO is funded 100% by sponsors and private donors. All donations and sponsorships are raised to support the school activities in the local community in Rio de Janeiro therefore registration fee would not be an easy task for the NGO if they had not been part of the list of teams which received financial support from Norway Cup. “We are very satisfied and humble with the support we received from Norway Cup with cooperation with Norad (Norwegian Directorate for Development Cooperation). They believed in us. If it wasn’t for them, we couldn’t afford it and wouldn’t be possible to be part of the competition”, explains the leader. The team's next challenge is Sandarcupen from Friday 11th to Sunday 13th in Sandefjord (92 km Southwest from Oslo). In 2017, the tournament registered a new participant record: 771 teams of boys and girls from 8 to 19 years old.